In a swine facility near Peoria, Illinois, microbiologist Terry Whitehead collects fresh manure samples to use in tests to identify bacteria that may be involved in odor production. Storing and reusing swine manure for fertilizer makes good environmental and economic sense, but managing foul-smelling manure is probably one of the least favorite tasks on a producer’s to-do list. Now, findings by Agricultural Research Service microbiologists Terry Whitehead and Mike Cotta may someday give farmers options for odor control that will protect livestock health and help restore harmony between rural producers and nearby residents. Odor from swine manure contains hundreds of compounds, so it’s difficult to find the specific ones that are the main culprits contributing to the bad smell. These compounds are made by microbes that break down undigested feed and other materials in the manure. Scientists have determined that one group of these microbes, sulfate-reducing bacteria, produces hydrogen sulfide. Hydrogen sulfide and other sulfur compounds make up about half of the offensive odorants from swine manure. But manure generates more than just a distinctive odor. Bacterial activity in manure pits also generates methane and nitrous oxide, which are both greenhouse gases. Research conducted by scientists elsewhere has indicated that tannins—compounds naturally present in tree leaves and other feed materials—can block bacterial activity in the guts of ruminant livestock such as dairy cows, which in turn lowers digestive efficiency and effectiveness. To Whitehead and Cotta, who are in the ARS Bioenergy Research Unit in Peoria, Illinois, this observation suggested that perhaps the tannins could be an effective agent for controlling the compounds that produce odor associated with manure. The scientists conducted a laboratory study to evaluate the effectiveness of tannins from the quebracho tree, which have been used in other studies of ruminant digestion, in reducing the emission of odors and greenhouse gases from swine manure pits. 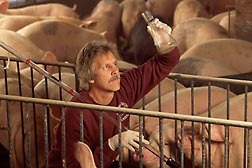 The scientists collected swine manure from a local producer and incubated it under laboratory conditions that mimic on-farm conditions. This allowed them to test the effects of adding tannins to the manure by monitoring gas emissions. They also determined the levels of sulfate-reducing bacteria that typically flourish in that environment. Seven days after the researchers added quebracho tannins to the manure, they found that hydrogen sulfide and methane production had been reduced more than 90 percent and that production continued to dwindle for another 3 weeks. Sulfate-reducing bacteria populations also significantly declined, by 70 to 90 percent, in the tannin-enriched mix. Larger-scale testing at swine facilities is needed to determine whether the tannins have similar rates of efficacy in commercial swine production facilities. If these findings are replicated in field-scale studies, quebracho tannins could be used in manure pits to reduce the activity of sulfate-reducing bacteria and the amounts of hydrogen sulfide and methane. The benefits of this approach would be twofold: Producers would have a cost-effective way of mitigating odors and greenhouse gas emissions, and when the manure is eventually spread onto the fields as fertilizer, the added tannins would not pose a risk to the environment. Whitehead and Cotta published their results in the December 2012 issue of Applied Microbiology and Biotechnology.—By Ann Perry, Agricultural Research Service Information Staff. This research is part of Agricultural and Industrial Byproducts, an ARS national program (#214) described at www.nps.ars.usda.gov. Terry Whitehead and Mike Cotta are in the USDA-ARS Bioenergy Research Unit, 1815 N. University St., Peoria, IL 61604-3999; (309) 681-6272. "Controlling Odors and Greenhouse Gas Emissions From Stored Swine Manure" was published in the May/June 2014 issue of Agricultural Research magazine.